On October 13, 2016, the Armenian Eye Care Project (AECP) celebrated World Sight Day in Armenia — an annual day of awareness held on the second Thursday of October to focus global attention on blindness and vision impairment. This year, we celebrated the day by inviting high school students from several schools in Ijevan and Spitak to visit our Regional Eye Clinics in those cities. Students became more acquainted with ophthalmic devices and more informed of the nuances of the ophthalmologist profession. After the tour of our Regional Eye Clinics, the students participated in some hands-on activities — like administering their own eye exams — as well as an online contest organized for them at the end to test what they’d learned from the trip. In addition to the field trips to our Regional Eye Clinics in Ijevan and Spitak, we also organized classes on eye care throughout Armenia — ranging from public schools in Yerevan and the Marzes to special schools for children with disabilities and hearing impairments to the Orran Shelter. About four percent of the world’s population is visually impaired, with roughly 39 million who are blind and another 246 million who have extreme vision impairment. Luckily, 80 percent of cases of visual impairment can be overcome. The most common causes of vision disruption worldwide are lack of vision correction (eyeglasses), cataract and glaucoma. Since 2003, the AECP has screened nearly 400,000 people in Armenia. 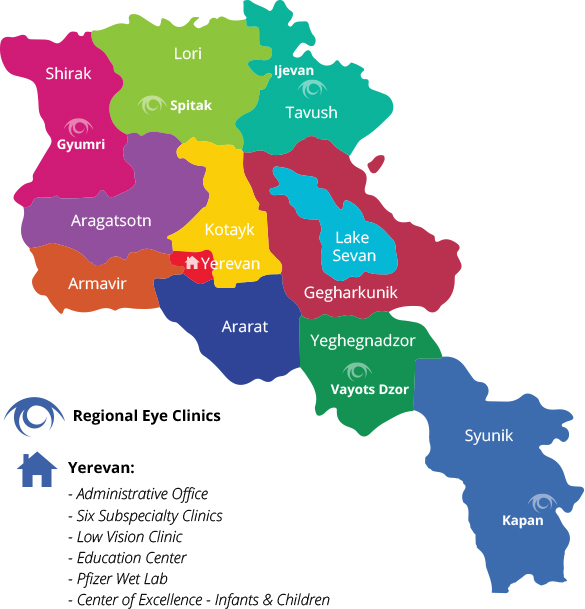 Over 13 percent of Armenia’s adult population has at least one eye disease that can cause blindness. Among those aged 50 and over, vulnerability to eye disease is almost three times more, at 37 percent. With an emphasis on public education and early intervention, we can eliminate preventable causes of blindness in Armenia and make quality eye care accessible to all Armenians in need!